► What's it like to live with? Just a quarter of a mile later, the road crests a rise and drops down the other side – with a noticeable compression if you're shifting. Here the Audi's behaviour was quite bizarre, the car bottoming out before bobbing up and down three or four times as its springs and dampers conspicuously failed to deal with the body's movement. Most unnerving. So the car's too sporty, too stiff? If only it were that simple. Because about half a mile later I throw a right turn onto one of the most viciously uneven tracts of public road imaginable. Here, in its Comfort ride setting (Dynamic's untenable away from racetracks, and a bit of a waste of space), the Audi was a picture of oily compliance. Weird. Incidentally, our test car boasted the RS Sport suspension with Dynamic Ride Control, a £3250 option potential buyers can happily forego (together with our car's £3250 carbon roof and £1200 sports exhaust). So, our time with the RS5's been a regrettable six months of bouncing in our seats and wishing we've gone for an M4? No, not at all. But undoubtedly an M4 is more easily understood, and judged. In its level of refinement, its shyness to offer up sweaty-palmed thrills and its slightly underwhelming power-to-weight (and power-to-price) ratio compared to the M4 Competition and the C63 S, the RS5 meets a different set of needs. Big wins? Mainly it's been the long, multi-road journeys, at least partly backing up Audi's assertion that it's a modern, techy take on the timeless GT formula. Take the sortie out to North Wales for the Our Cars mega-test in last month's issue. A diesel saloon like the 530d would have made a slightly better (and certainly more economical) fist of the motorway first half, and something like a Cayman or an Elise a more involving, exciting ally on the quick and challenging Welsh A- and B-roads that followed, but the RS5 proved a masterful halfway house, a house hurled along by a twin-turbo V6 so effective at executing overtakes I wouldn't bat an eyelid if Audi some day confesses that it actually develops 555bhp, not 444. Six months ago I had the feeling a long-term appraisal of the RS5 would show it in its best possible light, and help its qualities offset its paucity of thrash-me-quick thrills. 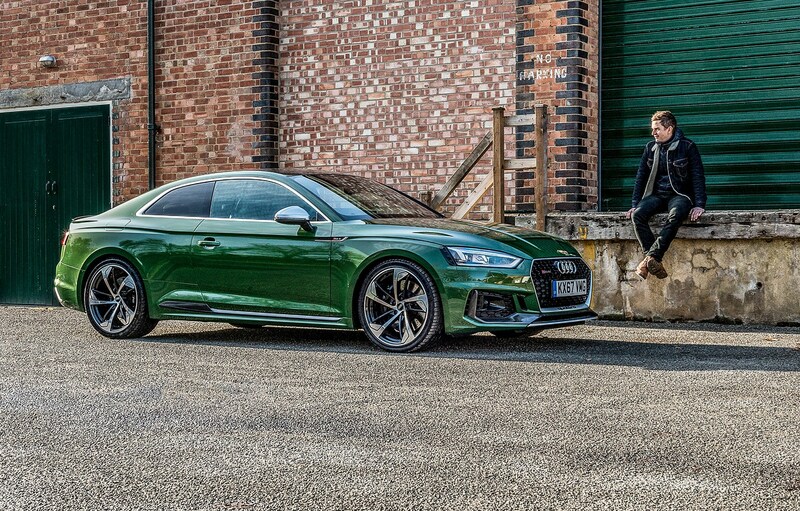 And to an extent it has: the RS5 is a beautifully built, terrifically fast and decadently refined two-door performance car that'd slot into your life tomorrow without many compromises (unless you regularly use rear seats, in which case you definitely want the more practical and affordable RS4). But however much time you spend in it, the RS5's ability to almost completely insulate you from almost all of the risk, jeopardy, thrill and satisfaction of fast road driving never stops being as impressive as it is infuriating. When is an RS5 faster than a Ferrari Superfast? When it's crossing Belgium. This month, driven by photographer Alex Tapley, the Audi made up a full hour on me in the V12 thanks to its smarter nav. The Ferrari considered Brussels at 5pm on a Friday a good idea: the RS5 knew better. In fact, the Audi spent four days not being embarrassed by the 812. Easier to live with, the roomier RS5 also swallowed a load more equipment and proved infuriatingly difficult to shake on daunting Belgian backroads. Are all photographers F1 drivers yet to find their true calling? 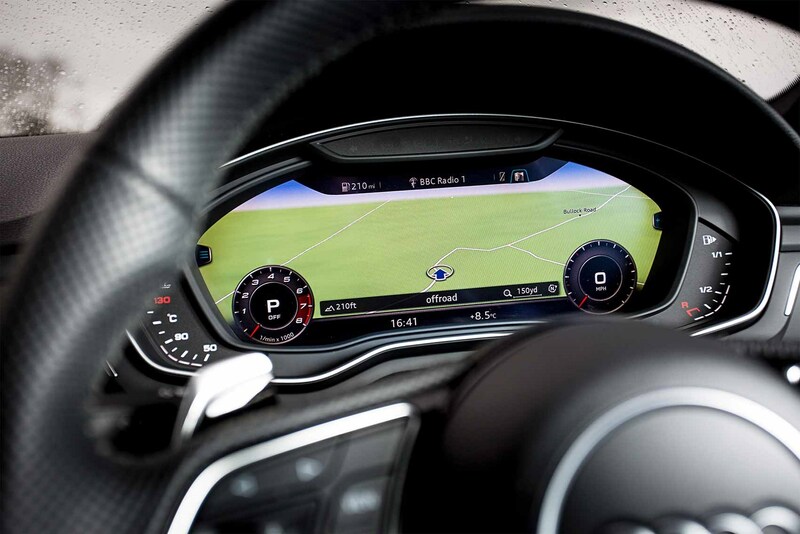 Early on it’s the obviously trick stuff that impresses; Virtual Cockpit’s map display on the last critical mile or two to a hard-to-find address, or the way the relevant display on the digital climate display swells in size as its cool aluminium controls sense your approaching digit. But in time, with miles and months, the love blossoms thanks to the less overt but plainly well thought out stuff. 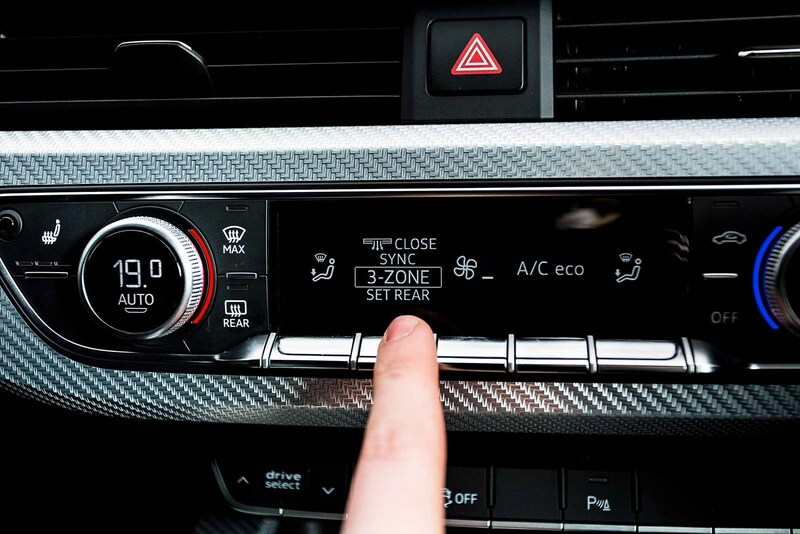 …like the handy off button for the infotainment screen, so that when you’re tired and know where you’re going you can kill its glare. There’s also a user-defined button on the steering wheel that I’ve set to toggle drive modes, letting me optimise the set-up – F1-driver style – on the fly and without looking by casually prodding it with my thumb. 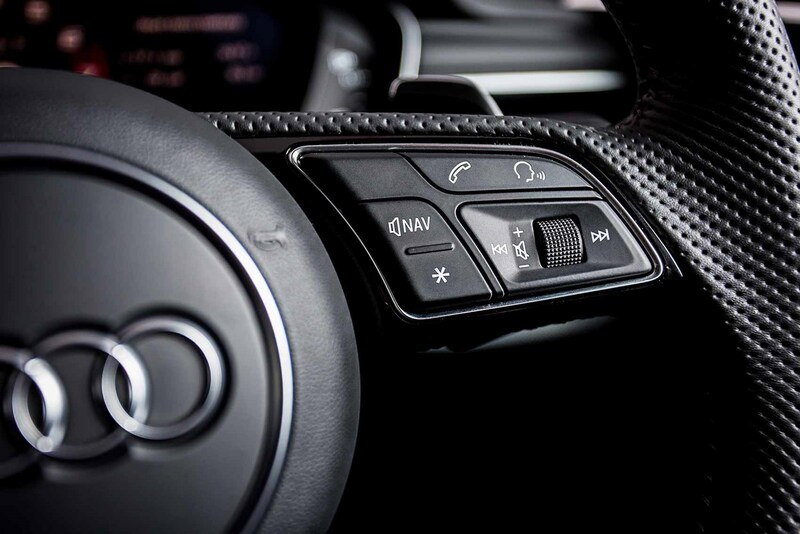 Fundamental ergonomics are all good: adjustability to send the seat DTM-low; a slender, nicely sculpted wheel that feels McLaren-inspired; and an elegant, uncluttered dash that promotes a welcome sense of confident calm. 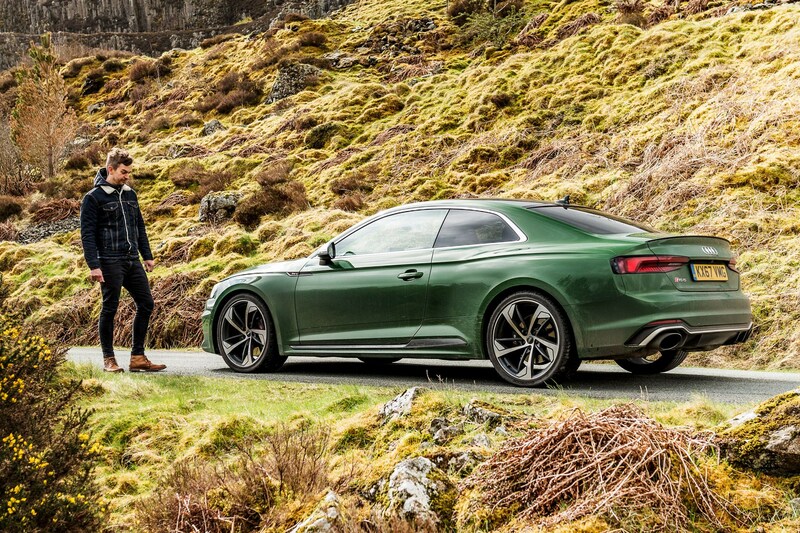 Test drive an RS5 and you’ll like its ludicrous turn of speed and its incredible traction. But should you take the plunge it’ll be the interior you grow to love. 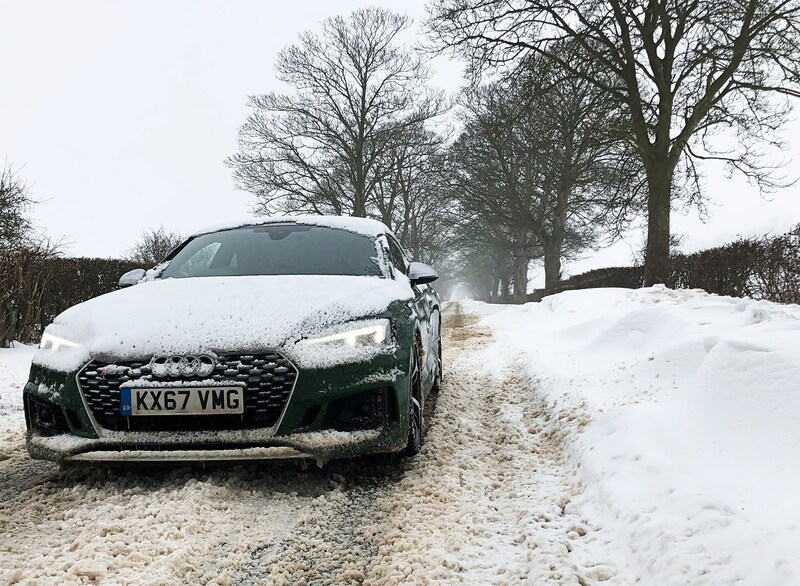 Month 3 living with an Audi RS5: how does it cope in the snow? Not a very seasonal update. But it's worth examining how the RS5 coped in last winter's snow. When the Beast’s snows came the RS5 proved a handy tool, if nothing like the oversteering frenzy of revs and flying ice I had in mind. Early March’s freeze hit Lincolnshire hard and without the RS5 at our disposal the last issue would have missed its print slot. In the Audi I dutifully scurried about picking up members of the team otherwise unable to get to work. On summer treads progress was slow, alive with slides and prone to pronounced understeer whenever I dared use the throttle mid-corner. But the Audi didn’t get stuck and if you ask the poor souls who spent the night marooned high on the M62, that’s the main thing. 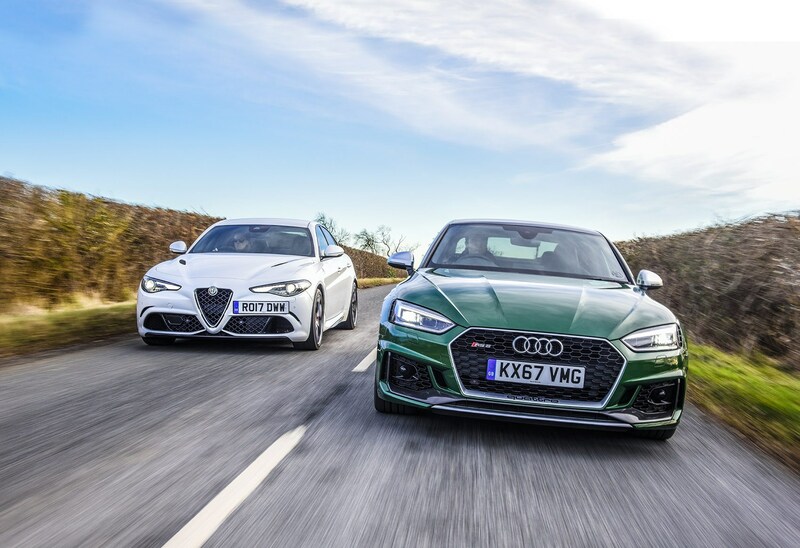 We're lucky enough to be running Alfa’s Giulia Quadrifoglio and an Audi RS5 Coupe on the long-term test fleet at the moment. Which one would you pick? This battle is one that rages most days in the CAR office, so we thought we'd capture some of the office debate in this report. This month Ben Miller and Phil McNamara flitted between each other’s daily drives in the name of science. 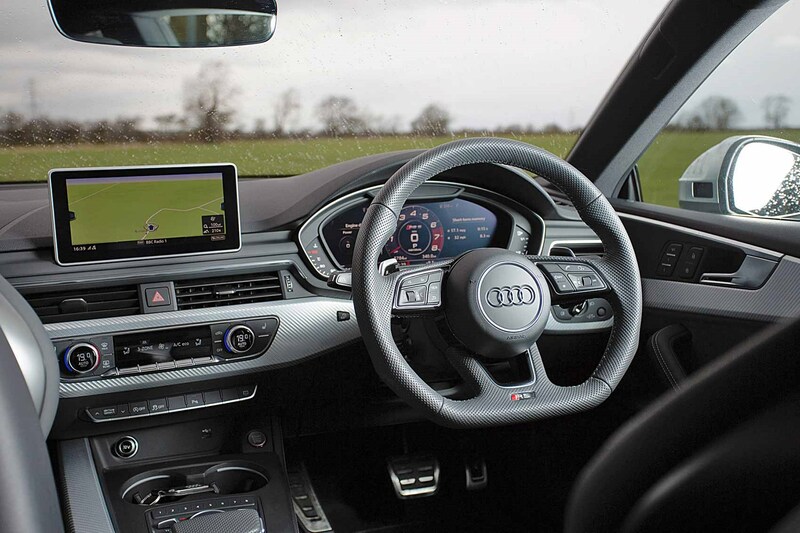 BM: Indeed, though much of the Audi’s tech is lost on me – I don’t use it. You’re right about the refinement, though. On the adaptive dampers the ride is impressively pliant: I recently drove an RS4 without the adaptive dampers and it was fairly unyielding. For me it’s the two engines and drivetrains that really set the two apart, though. I already had a hunch the Audi’s engine wasn’t sufficiently charismatic, and the Alfa has confirmed it. The Audi never feels slow, thanks in no small part to the fabulously polished quattro powertrain, but 444bhp isn’t enough relative to the C63 S AMG or the Alfa. And after the Giulia’s mad top-end rush, the Audi’s delivery is just so linear; effective, but not exactly thrilling. 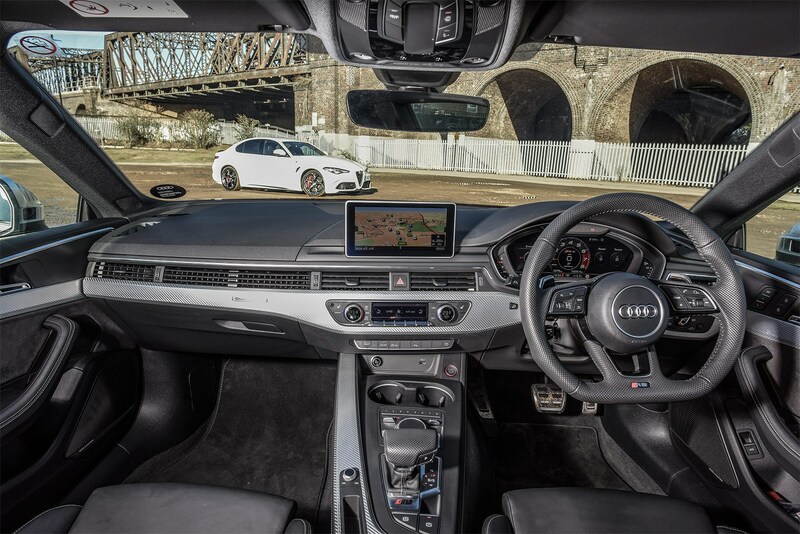 PM: You’re right – on the road, the RS5 always manages to feel quick. That smooth delivery and rich torque make for ultra-rapid overtaking but the Audi’s engine is so lacking in emotion, whereas the Alfa sings. The Giulia’s is one of the best sixes on sale, no doubt. Yes, the Audi has that spread of torque but it might as well be a twin turbodiesel. When you rev the Alfa out it sounds incredible, and the auto ’box is surprisingly sharp. I don’t agree you need it in everything-off Race mode to enjoy the Giulia; it’s thrilling and sonorous in Dynamic. BM: It is, but Race mode is just so fabulously lairy, I don’t know why you’d waste a journey not being in it. Twist the dial round, soften the dampers with Alfa’s equivalent of bumpy-road mode and the Giulia just comes alive: noise, drama, a rear axle you feel telepathically in tune with, hyperactive steering that lets you drive with your wrists like a Caterham… It’s just so immersive. Before and after a fast drive in the Giulia I find myself taking a moment and doing some deep-breathing exercises. You could say that means the Audi’s demonstrably superior, and it probably is by any objective measure, but I love the Alfa for the fire in its belly and the fact that it makes every mile memorable. PM: Straight up, I’d have the Alfa over the Audi any day of the week. The exterior design is more beautiful, with a handsome cab-back silhouette that’s covered with nice details; the Alfa Romeo shield grille, the beautifully integrated bumper vents like a Spitfire’s plan view. By contrast the A5 has gone from being beautiful to overwrought. With these two it’s technocrat versus organic beauty. And the Italians win. PM: Steady on! I’d like to think my £150k dream garage would be a little more imaginative than that – but I take your point. The Giulia Quadrifoglio is simply more of an event, and to have Alfa Romeo go from nowhere to being in contention with an RS Audi, behind which there are decades of evolution, is quite an achievement. I dropped in on my nearest Audi dealer the other week, for no other reason than it’s on my way home and I’d spotted an all-black R8 on the forecourt I thought needed its tyres kicking. Sipping a complementary cappuccino, I entirely missed the all-new A8 on the illuminated plinth – whoops – swooned over a battleship grey Q2 and stopped dead at a used RS6: if only. I also chatted to the RS sales honcho, casually enquiring as to the popularity of the RS5 thus far. They hadn’t yet sold one, with the three potential buyers who had been in touch instead opting for an S5. You can see their point. 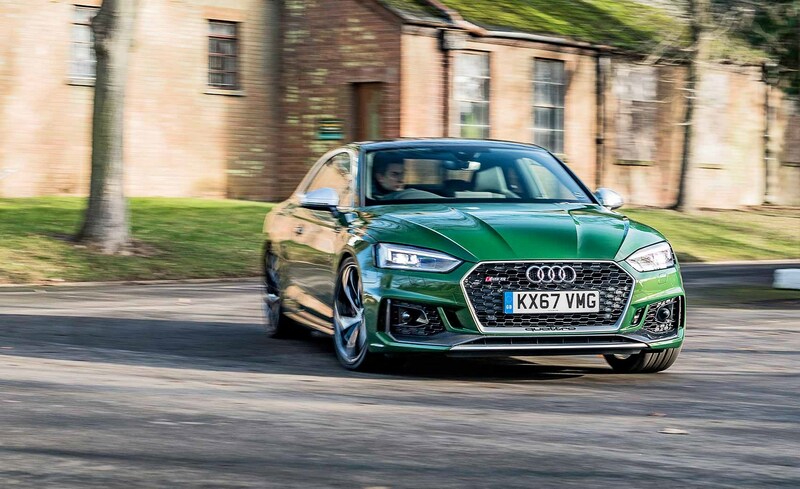 Where RS5 (444bhp, 3.9sec 0-62mph) prices get out of bed at £63,575, an un-optioned S5 (349bhp, 4.7sec 0-62mph) starts at less than £50k (£48,850) and does a pretty convincing impression of a fast, handsome and very desirable big coupe. Perhaps the performance differential doesn’t justify the extra spend. By contrast he’d already sold half a dozen RS4s: clearly the fast estate is a simpler, more persuasive proposition. 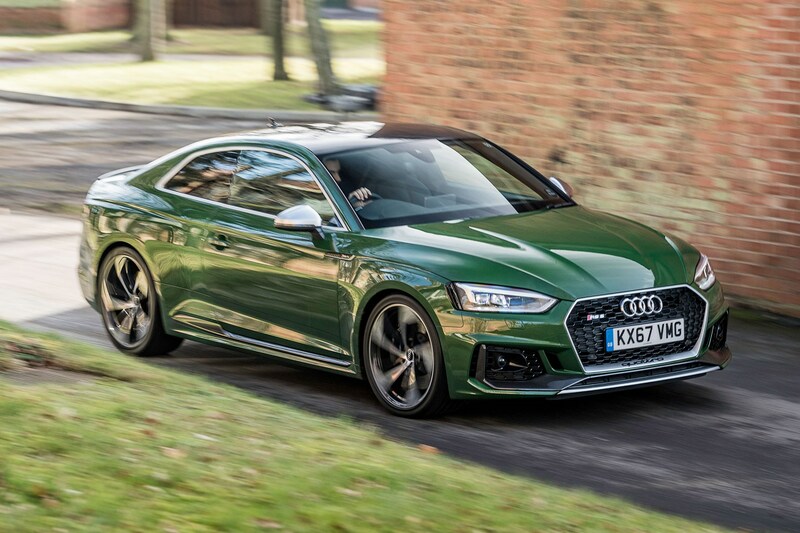 Then you see our RS5 in controversial but spectacular (when it’s clean) Sonoma Green metallic (£645) and wonder how on earth anyone convinces themselves that it might not be the vaguely practical fast Audi they need. The arches, that slick matt aluminium RS detailing, those giant 20-inch forged wheels (£2000) – it’s a masterclass in acceptable (just) visual menace. So, it looks great, but that £63k start line is a distant memory thanks to out optioning marathon. The scariest numbers sit next to that Carbon Matt Aluminium Styling Pack (£4450), those wheels, RS Sport suspension with Dynamic Ride Control (hydraulically linked dampers for variable roll control, £2000), the £3250 carbonfibre roof and the £1200 sports exhaust. Intriguing kit I’m keen to get to know includes the Driver Assistance Pack, a £1250 raft of tech including adaptive cruise with traffic jam assist, predictive efficiency (I’ll take all the help I can get), collision warning, lane assist and turn assist, among others) and Audi Phone Box, which offers ultra-lazy wireless charging with compatible phones. You’ll notice the lack of wacky dynamic steering or big-money carbon-ceramic brakes. Mostly, though, I’m looking forward to that incendiary twin-turbo V6, which feels at least 100bhp more potent than the 444bhp Audi claims, serene all-wheel-drive quattro traction (complete with sports differential, standard on UK cars) and a cockpit that blends elegant tech and laser-aligned build quality with the German sporting trope of lots of black studded with expensive shiny bits. Three years ago I ran an M3 through these same grisly winter months. The nervous, torque-heavy BMW wasn’t happy until spring arrived, with its baby lambs and grip. 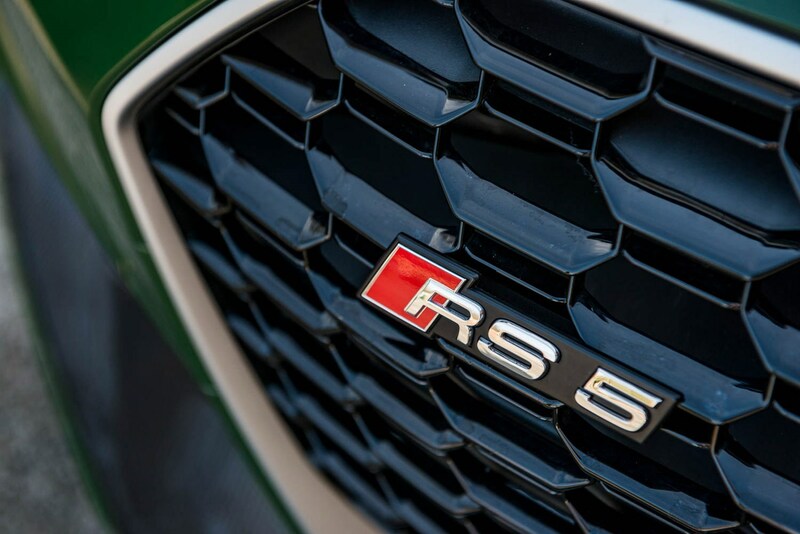 The RS5 will, I’m sure, get straight down to business.